Today, April 22nd, marks the 40th annual Earth Day. Founded in 1970 by United States Senator Gaylord Nelson, the observance day began — ironically — as an American-centric “holiday” to raise awareness of the importance of environmental conservation in the United States. Largely a day lauded by tree huggers and scorned by legions of kool-aid drinking conservatives (people who don’t believe in conserving anything), the current iteration of Earth Day serves as a poignant example of what the concept of “going green” means to everyday Americans: it is nothing more than a slick marketing term sold to the masses to make us feel better about our insatiable consumption. What is so ironic about Earth Day and conservation in America? With less than five percent of the Earth’s population, “U.S. Americans” consume more than a quarter of the planet’s fossil fuel resources and contribute approximately 278 million tons of un-recycled waste into the environment each year. Fear not — an additional 120 million or so tons are “recycled,” so pat yourselves on the back. For many, going green simply means disposing of empty water bottles, beer cans, Pringles containers, boxes of Pop Tarts, and an array of other cardboard boxes from so-called food items into a different collection bin that magically saves the environment while allowing people to belly up to Wal-Mart and buy more product. Saving the environment by consuming more products, in essence. Some have adopted the eco-friendly Hummer as a primary mode of transportation. The lemon-lime green finish is particularly ecologically-friendly. 1) Purchase a new fuel-efficient vehicle. Current U.S. government mandated fuel economy standards for new cars are a mere 27.5 mpg for cars and 23.5 mpg for trucks. 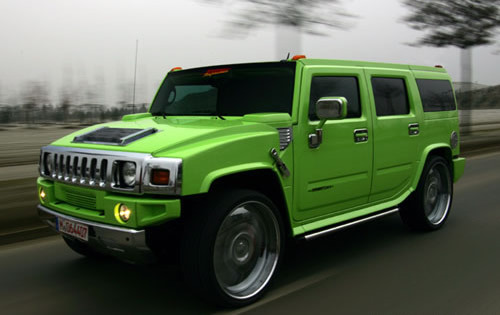 This means you can still be “green” and drive a Hummer. Well, not quite, but it’s close enough when you round up. New regulations will raise the threshold to 34 miles per gallon by 2016, but you still have plenty of time to hold your head high and revel in this standard of environmental conservation that only we in America are so fortunate to enjoy. Many have upgraded their computers and electronics, purchasing new and energy-efficient models each year. 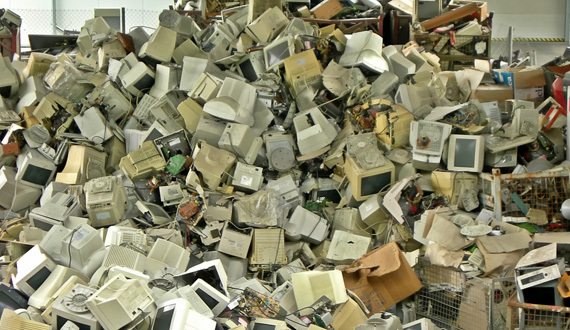 Old systems are recycled in landfills located in developing Asian and African countries. 2) Purchase new computer, television, and/or electronic equipment. Older models of all electronic devices and appliances are not nearly as energy efficient as current-year models. This means you need to get in the Hummer and speed down to the closest Best Buy or Costco and replace all household appliances. Transform that old 32-inch Magnavox cube tube into a luminescent 72-inch Vizio plasma screen TV. This also allows you to be a responsible citizen and recycle your old equipment, which will most likely be loaded onto a gargantuan ocean liner and sent to distant landfills in foreign countries where local citizens will reap the benefits of basking in a plastic-silicon sea of radiation. 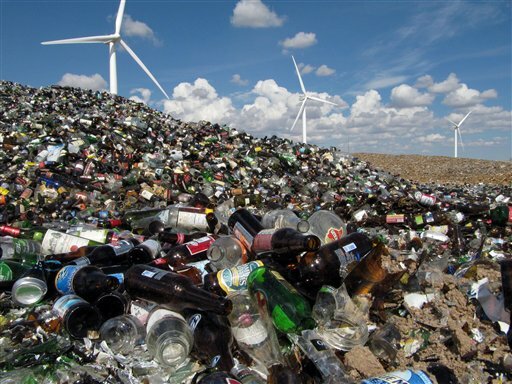 No longer profitable to recycle, glass sits idle in "recycling centers" in many states. 3) Only purchase and consume beverages contained in plastic bottles. Does your town collect glass as part of its recycling program? Chances are, they do. However, after collection, the glass is likely hauled off to an elegant pasture, as depicted in the photo to the right, where it waits patiently for the prospect of recycling glass to become profitable. You see, going green doesn’t just mean conserving and protecting natural resources — it also implies that these efforts must generate money. You don’t really think the term “green” refers to grass, trees, foliage and shrubbery, do you? 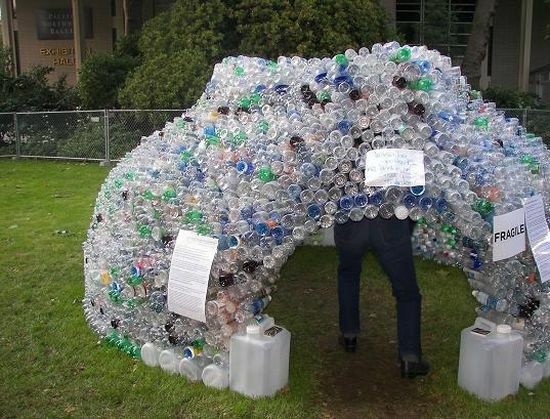 Empty plastic water bottles provide sturdy, affordable building material and allow homes to stand the test of time. From the moment we learn to read, we are taught the valuable lesson of the Three Little Pigs — only the strongest of building materials will keep you safe from the both the elements and the proverbial Big Bad Wolf. Plastic bottles have steadily risen in popularity to the point that many architects and home builders are beginning to opt for these sturdy building blocks as their materials of choice when creating new structures. As most of us simply choose to recycle, this is still a highly avant garde approach in “going green.” It also promotes the sharing of this valuable resource with foreign recycling farms, where companies from the U.S. undertake corporate social responsibility initiatives and pay governments in developing countries handsome amounts to accept these transparent plastic vessels as a token of good will — a true win-win proposition for all involved. Perhaps the biggest impact one can make toward saving the planet Earth is to stage a worldwide concert event, as was done with Live Earth in 2007. What better way to promote green living than hosting 100,000 concert-goers in a giant stadium, where they may each purchase several plastic water bottles, recycle the empties directly onto the stadium grass (it’s not littering if it can be recycled), freely consume as much food and beverage as their budgets allow, and wallow in the musical soundwaves generated by crappy pop artists whose sound and lighting equipment is powered by a dozen industrial strength diesel-fueled power generators. This method is perhaps the most perfect way to practice the double entendre method of “going green” — that is, pretending to save the environment while making money. So what is the true lesson we learn each and every Earth Day? On this day, we are able to separate ourselves from the daily grind and contemplate the inalienable truth of environmental conservation in the United States of America: it doesn’t really matter what you do because it WILL NOT make a difference. As long as we have large corporations paying off the politicians to remain dirty; as long as we have oil spills in the Gulf of Mexico and elsewhere — and continue to drill; as long as our emptied soda and beer bottles wait for somebody to figure out a way to make an easy dollar off recycling glass (or, in the true spirit of American capitalism, wait for government to pay large subsidies to a private company to do it), we have the power to “go green” while staying true to the American value of laziness. I implore you on this Earth Day to guzzle a few 32-ounce Vitamin Waters, top off your car’s fuel tank with the $5 per gallon premium unleaded gasoline, simultaneously power on all of your new household electronic devices, and delight in the simple fact that being green in the U.S. of A. is easier than ever. This entry was posted in Lifestyle and tagged biodiversity, concert, conservation, Day, Earth, environment, fuel efficiency, going green, green, Live Earth, preservation, recycling by Troy Beckman. Bookmark the permalink. Check, check and check. Doing all three. 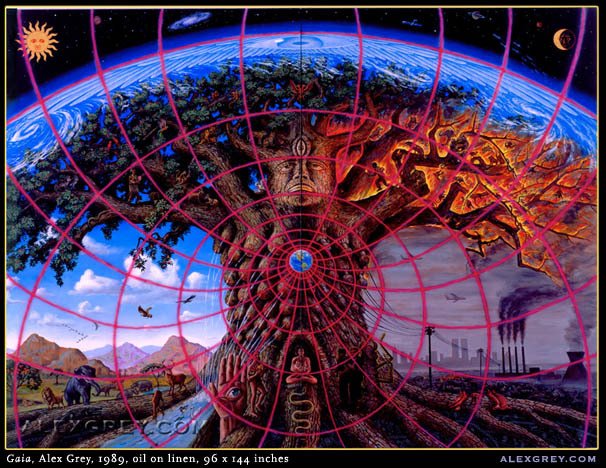 Great post/tribute to Earth Day. Some of us are old enough to remember when it was first initiated. We’ve made progress, but not enough and not fast enough. Green is not a color of choice, it is one of necessity if we are to leave the planet as well off as possible for future generations.